With just under two and a half hours to go before Apple CEO Steve Jobs takes the stage for his keynote address at the company's Worldwide Developers Conference (WWDC) in San Francisco, it's time for us to set the stage with final details on the latest rumors and coverage information. Attendees have been securing their spots in line early to ensure that they will have seats in the main auditorium rather than being shunted to an overflow room to watch the keynote on video. As we noted over the weekend, MacRumors will be offering live text and photo updates from the keynote through MacRumorsLive.com. The main MacRumors.com page will automatically redirect to MacRumorsLive as we get closer to the event, so stay tuned here. We will also be providing Twitter updates through our @MacRumorsLive account. 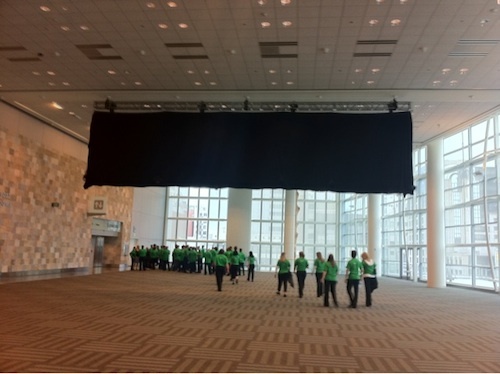 Apple has not yet offered any indication that it will provide live streaming video of the keynote. MacRumors forum members interested in a "spoiler-free" environment to wait for the full keynote video to become available are gathering in our dedicated thread. A direct link to the official keynote video will be posted there when it becomes available. While it appears extremely unlikely that Apple will introduce a new iPhone today, the company undoubtedly has a full agenda as it seeks to show off Mac OS X Lion, iOS 5, and its new iCloud service. Rumors have suggested that the iCloud service could utilize a revamped iOS-based Time Capsule to serve as the hub for data access and potentially for caching software updates for other machines and devices. One key part of the iCloud service that has been receiving significant media attention is a music streaming service to allow users to access their purchased music from a variety of Internet-connected devices. Apple is said to have paid the four major music labels up to $150 million for the right to offer the service, and with agreements reportedly also in place with the major music publishers, Apple appears nearly ready to go on that aspect of iCloud. The service has been said to come with a free trial period to be followed eventually by an annual fee in the range of $25. iOS 5 has been kept under wraps by Apple thus far, although we've seen indications of enhanced notifications and widgets as well as "deep" Twitter integration. Another development comes from a leak on Apple's iTunes update pages, which revealed a new "Automatic Download" feature that could allow users to have updated apps and perhaps other content appear on their iOS devices without the need manually sync each one. It is unclear, however, whether the feature is directly tied to iOS 5 or if it could be supported with an update to iOS 4 in the nearer term. Apple has also been working hard on Mac OS X Lion and a fair amount of information on the release has been made public through Apple's "sneak peek" offered last October and followed up with a series of developer preview builds pushed out beginning in February. Apple has said that Lion will make its debut this "summer", but we've been hearing variety of potential dates within that period for the launch, making it difficult to pin down how soon after WWDC we can expect it to ship. - This is my next... reports that it has received information regarding iOS 5 enhancements including a new MMS/SMS messaging protocol and a new notification system involving a dropdown at the top of the screen accessible by swiping downward. The dropdown will also provide access to widgets for such items as weather and stocks. Finally, the lock screen is said to have been enhanced with notifications, allowing users to swipe a notification to go directly to the corresponding app. I will be heading into work and barricading myself in my office so I can watch the updates. iPhone 3GS supported! Ha! In your face unbelievers from that stupid rumor thread. Everyone who laughed at me and others for stating facts that proved it would be need to now apologize deeply and lengthily. Only kidding, if it happens, baby comes first! BBM rip off. Where is Apple's substance this year? This just looks like a load of ripped off features! Ughhhhh I wanted my iPad to be more like my Mac not my Mac to be more like my iPad. 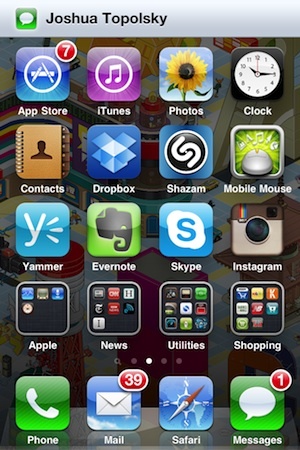 Holy crap, iCloud/Mobile Me is free!!! Who says Apple infringed on anyone's IP?? 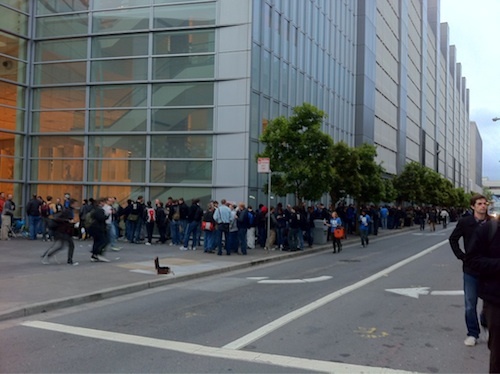 Anyway, a landmark WWDC. Good show. You don't think that Lord Jobs' notification system doesn't MIRROR the look and feel of the earlier Android notification system? Blind.